The Lizzie McGuire Movie heralds the end of one of the most successful and popular young adult series' to reach our screens in recent times. In the same vein as The Princess Diaries, Lizzie is welcomed into our living rooms and into our hearts with the teenage girl fairytale of 2003. Somewhere along the line, everyone’s dreams have come true in a movie, whether it be becoming a pop superstar in The Lizzie McGuire Movie, a princess in The Princess Diaries or a jazzy diva in Chicago, cinema has a way to momentarily switch off your reality and create an immersive and idealistic world that you can visit to relive your wildest dreams. 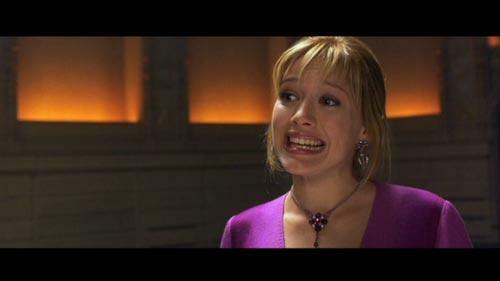 Films such as The Lizzie McGuire Movie stand as a way to expand the kids’ imaginations and entice them to sing and dance, keeping their minds active without introduction violence, language and drugs. Saying this, as a 20 year old, and a male at that – not really the target audience - this G rated film is just that, general exhibition for all audiences, and something that audiences both young and old alike can enjoy, relate to and be swept away by. 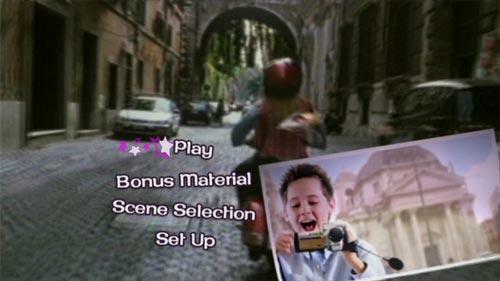 Shot in an anamorphic Panavision process, The Lizzie McGuire Movie is presented in its original widescreen aspect of 2.35:1, and is anamorphically enhanced. The quality of the image is superb, with only minor flaws holding it back. Throughout the film, a gentle wash of fine grain covers the image, giving the picture a light texture, yet even during the darkest scenes this is not a problem at all. Colours are bright and warm, holding a nice level of saturation but at times giving the feeling that a hint more life in the colours would do the tone of the film more justice. Blacks are deep and solid, showing no sign of low-level noise, however the dark scenes appear too dark with very poor contrast, making shape definitions somewhat hard to identify, with shadow detail that sometimes appears too murky. The source print used was clean enough to render film artefacts completely absent, giving a clear and fresh image throughout the film. Even the spherical issues during the film’s theatrical run in mid-2003 are absent, with a reasonably sharp picture throughout, as well as a stable clarity, yet at times it looks a tad soft on focus. Spread over two layers on a single-sided DVD, a layer change occurs at 52:39 and is awkwardly placed, stuttering through the scene. What, and I'm meant to find him attractive? Audiences have a range of audio options to choose from; we can have a Czech Lizzie, a Hungarian Lizzie, a Polish Lizzie or a Russian Lizzie if we get bored of the good ol’ English Lizzie. All five of these tracks are presented using the Dolby Digital 5.1 compression technology, and the English track is your primary and best option, assuming English is your thing, of course. Dialogue is pretty much clear throughout, except for some appalling accents from Paolo which do require the use of the subtitles, which luckily are nearly word-for-word perfect. Dialogue comes from the centre channel, with the synch spot on and not the faintest inkling of distortion. With a supporting soundtrack full of a range of pop songs, this audio transfer really shines when one of these tracks starts, giving rich and bassy delivery, both enveloping, aurally enthralling and really cheering up the mood in your living room. Mr. Woofer gets a chance to punch, really letting rip during the pop soundtrack and filling the room with warmth and depth. The surround channels, like the front left and right, carry very little in the way of discrete effects, but provide plenty of ambience to build you up. One noticeable occurrence of front panning occurs on the animated Lizzie at the 35 minute mark where she moves to the right of the screen, and the front-right corner of the soundstage, but just looses oomph on the way and disappears before she’s finished yapping. Apart from this one issue, the levels are spot on. From the slickly animated 16:9 enhanced menus, we know we’re in for some fun with these extras – and that’s exactly what we do get, but sadly nothing more than “fun”. Sure, it’s aimed at teenage girls, but you never know - there may be a young Sofia Coppola out there somewhere. 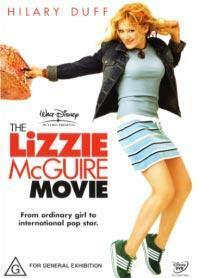 So who would you be in Lizzie’s world? Take this quiz and see who you would be if you were to be cast in the film. Starting off is a female or male option, with questions then directly built on the simplistic superficial qualities of the characters. While reading the questions and multiple-choice answers, you can pinpoint which answer relates to which character, but still some cool audio clips and video clips at the end are sure to keep the younger ones occupied. This 11:54 featurette is presented in a full frame aspect, with letterboxed film samples and a Dolby Digital 2.0 soundtrack. This brief featurette shows some behind the scenes footage, and is aimed directly at the target audience, offering no insight into the movie making process, just how cool shopping, acting, singing and dancing really are. Now not only can she act (?) but she can sing too – and Why Not? is a perfect example of some happy pop music that really just makes you wanna get up and shake your booty. Presented in a 1.33:1 aspect with letterboxed film samples at 1.85:1, this clip also features a stunning 5.1 remix which packs a huge punch. There’s nothing special in the way of 5.1 discrete-ness, but the dynamics and enveloping effect are just so rich and sound awesome – after all, isn’t that the main thing? Cool – some behind the scenes stuff at a recording studio. Well, “cool” easily turns to “fool” when this sad attempt at advertising Duff’s album runs ultra short with a running time of 2:06 and shows an Exorcist-style possessed mixing deck and some footage of Duff singing – and acting at the same time – wowee, what a stretch! It discusses her goals with her music, but really is just like an infomercial. This 2:15 clip is presented in a 4:3 presentation with raw and time-coded film footage letterboxed at 2.35:1, with a Dolby Digital 2.0 soundtrack. This is just the sequence from the film where Lizzie and Paolo are driving through the streets of Rome on a Vespa. Three deleted scenes have been included, and feature an optional introduction from director Jim Fall. These clips do alter the pacing of the film, and the alternate ending gives a different finishing tone and would have worked, but what we do have still leaves you with a fuzzy feeling. The scenes are Kids Coming Off the Plane (0:28, 1:18 with introduction), Lizzie’s Shopping Spree (1:59, 3:07 with introduction) and Lizzie and Gordo Kiss (extended ending) (2:03, 3:12 with introduction). The Lizzie McGuire Movie is a superb way to finish off what became one of the most popular young adult television series' to hit our screens in recent times, following the success of Alex Mack. This film falls into the same category as The Princess Diaries and the upcoming film over Easter 2004 The Prince and Me starring Julia Stiles. These films are innocent, young chick-flick entertainment, and wholesome enough to warrant a purchase for young adults. For the fans out there, this film is sure to please, and even for Lizzie first-timers just in need of some harmless fun, give it a go as it's one of those warm and fuzzy movies that gives you some hope and shows that dreams really can come true. "It’s the teenage girl fairytale of 2003..."